Ben and Holly’s Little Kingdom: Planet Bong is out now on DVD and is the latest series of adventures from the Little Kingdom. Lara has been a big Ben and Holly fan for several years now and I will admit that I think I enjoy watching it even more than she does! There is something slightly more grown-up about the humour in Ben and Holly's Little Kingdom than in Peppa Pig (which is made by the same people) and I always look forward to seeing how the relationship between Nanny Plum and the Wise Old Elf will develop. 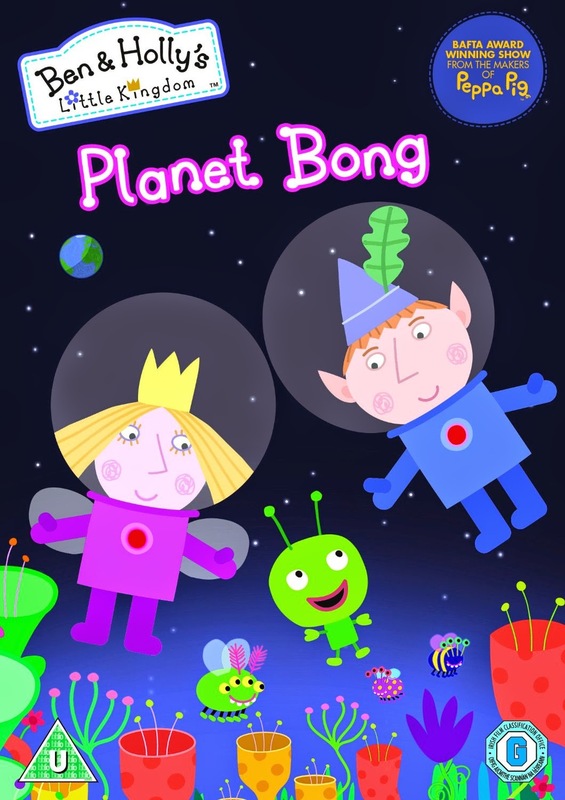 I haven't watched any Ben and Holly episodes with my girls for quite some time for one reason or another so I snuggled down with them one afternoon to watch the Planet Bong DVD! Planet Bong is one of the epic, two-episode stories that you occasionally find in the Little Kingdom. Ben, Holly and Nanny Plum are called to aid the Not-so-wise Old Elf who is trying to save face when challenged by an alien species to save their planet. Between them they must work out how to reduce the temperature and bring back plant life to a previously thriving alien planet where the inhabitants have been forced to live underground. It is quite amusing to see the Wise Old Elf admit that maybe he needs a little help every once in a while! The DVD also features a number of other episodes including the very silly "Chickens Ride West" and "The Mermaid" which, once again features Ben and Holly's human friend, Lucy, and she introduces them to her Dad who can' quite believe his eyes. All in all, the DVD features 10 episodes of this family favourite animation (nearly 2 hours of entertainment). My girls both loved it and I'd expect us to watch this DVD frequently over the coming months. Inspired by this latest Ben and Holly's Little Kingdom DVD, we've also been reading this Christmas-themed board book, "Christmas at the North Pole" which tells the story of when the elves and fairies have to make a crash landing when trying to deliver clockwork toys to Santa for his Christmas deliveries. The arctic elves come to help and they all look suspiciously like their Little Kingdom counterparts! In the end, Santa offers to drop them all back home in time for their fun festive feast. There is even a little song to sing on the last page. I don't remember having seen this episode of the TV programme so I can't remember the tune of the song so together Lara, Holly and I make up a different tune every time we read this fun, Christmassy book.